Railway Stn in Goose Lake. There are several others who moved from Deep Creek to other townships. See the Biographies Message Board for other bios. This must be abt 1906. 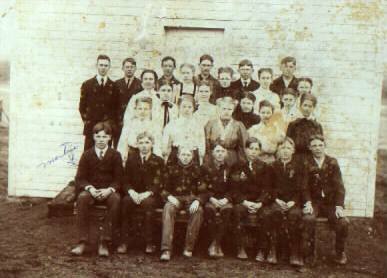 Merina Bielenberg was born in Oct 1900 and she is the little girl in the light dress, front row, left end. Looks like her first year. 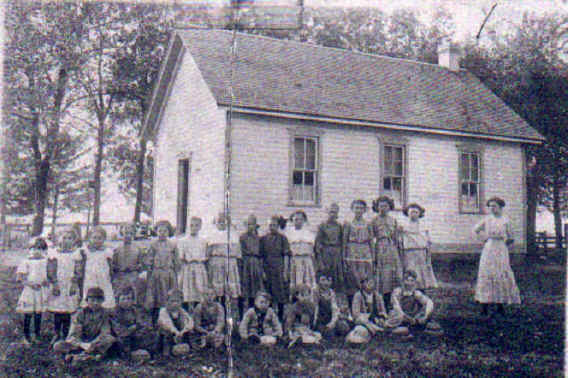 This is Glahn School, taken on the back door stoop, probably abt 1915. The only one I know is Martin Bielenberg (b. 1904) sitting in the front row on the left end seat. My grampa, Arnold H. Meyer, had a Ford Garage, Sales & Service in Goose Lake for 46 years. He was born and raised in Goose Lake. He died in July, 1963. 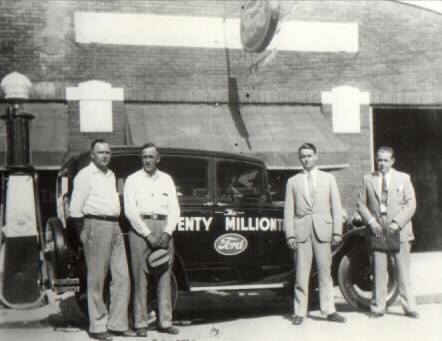 I don't know the date of the photo, but someone can probably guess by the age of the "new" 20 millionth Ford car to roll off the assembly line in Detroit that stands in front of his garage. My understanding is that he sold the 20 millionth Ford and was taking delivery of the vehicle, but I could be wrong. The two guys on the right in the suits are from Ford. The guy on the far left is H.C. Jepsen, banker, and next to him, A.H. Meyer, owner. There are quite a few farms in the area that have lasted over 100 years. See the Century Farms page. 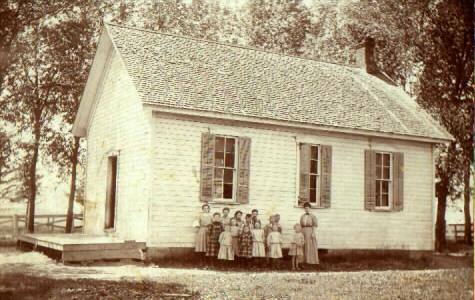 In the transcription you have done for the 1850 census of Deep Creek twp. under the surname of HUNTER, you have one name you are not sure of and used ? in place of a letter. I can tell you the correct spelling for this person's name is: Oziel. Oziel is the s/o Robert and Eliza (Jones) HUNTER who are listed on line 2 & 3 of residence #300 on pg# 203B. In the history of Goose Lake.....Philo Hunter listed as the first postmaster, is also the s/o Robert and Eliza (Jones) HUNTER. Robert's brother and several family members are buried in the HUNTER CEMETERY (not in Clinton Co.) that my husband and I started a restoration project of last year. I started searching Clinton County for my husband's JUDGE ancestors, never realizing I would find all this valuable info on the HUNTERs! Keep up the good work.....we appreciate you!